Have you ever wanted to listen to some music in the kitchen while you were making dinner, but you just didn’t have space to add speakers and an amplifier? How about having music playing in the background in every room of your house? Well, the good news is that whole house audio is not as difficult as you might think! Whole house distributed audio is a great way to improve your home, not only in value, but in lifestyle and livability as well. How do I get started and what equipment do I need? There are a few different ways to run extra speakers in your home. One option is to run the wire directly from a receiver, meaning the volume on your receiver controls the volume on the speaker. One nice feature available on most new home theater receivers is the addition of a powered or assignable second zone. Some receivers even have three or even four separate zone controls. A powered second zone on a home theater receiver will allow the addition of one pair of speakers to be used independently at the same time using a separate source. For example, you can be watching a movie in your living room in 5.1 channel surround sound, while the second zone, perhaps the kitchen, can be listening to a CD at the same time. Many manufacturers call this multi-room, multi-source capability. While the second powered zone feature is a great addition, it is really only intended to be used with one pair of speakers. If your 7.1 receiver doesn’t have a separate powered second zone, in most cases the 6th and 7th channel will be assignable to a second zone. Huh? What this means is that your 7 channel receiver can run 7 speakers only, so you can choose between a 5.1 system and two “zone two” speakers, or a full 7.1 system. If you want to run a 7.1 system and an additional pair of speakers, you will need another amplifier for the second zone. Another common way to send amplified sound to multiple rooms from a stereo receiver is to use an impedance matching speaker selector from companies like Sonance or Niles. A speaker selector can take the power signal from a stereo (2 channel) receiver or amp and distribute it to multiple pairs of speakers. The impedance matching ability tricks your receiver or amp into thinking it is just powering one pair of speakers, which protects the amplifier from damage. The only downside of the speaker selector is the audio quality and volume is diminished due to its being spread thin over all of the speakers as opposed to just a pair. Using a speaker selector can work well if you just want background music throughout your house and outdoors. If you are looking for more volume and higher quality sound the third option is to install a multi channel amplifier. Similar to a speaker selector device, a multi channel amplifier allows you to run multiple speaker pairs. It improves the sound quality by adding an amplifier to the mix. This will give you more volume along with better sound quality. Multi channel amplifiers range in price from a few hundred dollars to a few thousand dollars depending on the number of channels, power output and sophistication of the controls. Think about how you will use your system most often and get the amplifier that suits your needs. If you only plan to have one source and one volume control throughout your entire house, you can get by with a much less expensive amplifier. If you want to control the volume in every zone separately and have multiple sources, you will need to spend a lot more. If you want speakers in multiple rooms, the most important first step is getting the wires where they need to be. Running wires may seem simple enough, and it can be if done right… the first time. Before you drill a single hole or run a wire, we always recommend drawing out a wiring diagram and measuring the distance from the receiver to your speakers. Remember to always give yourself extra wire when running to a location; while this may seem wasteful, cutting off a few extra feet of wire is far superior than realizing that you are 6” short on a 50ft run. If you are going through the ceiling or floor, be sure to take into account the distance over floor joists and around studs. This can add significant distance to the run. It is good to buy your wire in bulk on a long roll and pull it from the source to final location before you make any cuts. This will ensure that you don’t cut your wire run too short. Once you have your diagram drawn up, count how many wires you’ll need and where they are going to end up. A few key ingredients are needed to make this work. First, you’ll need a hub, or a place where all of the speaker wires terminate. Each speaker will need two conductor speaker wires run to it, and usually each room will have two speakers. You will want all speaker wires run to the same location. This is where your receiver, amplifier or perhaps a music server will reside. Be sure to use high quality 12-gauge wire or CAT-5 or CAT-6 cable. Select a wire that’s durable enough and rated as safe for in-wall use. Lastly, unless your house is still at the framing stage, consider this – do you have either an attic above or crawlspace below the walls where you want to put the speakers? If the answer is yes, then you should be able to run the wires easily, if not… well, in our experience it’s time to look at other options, including high quality wireless solutions. Unless you use a volume control in each room, your receiver or amplifier must control the volume. Using one of these controls gives you the ability to adjust the volume in the same room as the speakers, instead of running back and forth from the receiver. When running wires to a volume control, the easiest method is to send a single run of four conductor speaker wires to the volume control, and from there, two (left/right) runs of two conductor wires to each speaker. If you want the ability to change the source, volume or music tracks, you’ll need a more complex control system in addition to CAT-5 or CAT-6 wire and speaker wire runs to each volume control in every room. Check out Russound, Elan and Crestron for advanced audio control systems. Usually this is done in a house that is pre-wired and professionally installed and calibrated. There are a few new gadgets available that can help by pass the need for an expensive control center, like an RF remote control, which is a remote that can control your components through walls using radio frequency — eliminating the need for volume controls or expensive touch pads. Using two channels from your receiver to power another pair of speakers in another room works great. 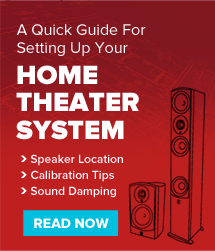 Most home theater AV receivers already have this feature built in and this simple solution that will only take a bit of effort to execute. You can also use an impedance matching speaker selector to add up to four pairs of additional speakers! Use a receiver with a second zone to send audio to a separate two channel amplifier. Similar to option one, a separate amplifier will give better quality sound and volume levels which is safer for the speakers! Tip: Use a multi channel amplifier for best results (look at Emotiva and Parasound). Go big, and check out Crestron. This is our, “If we won the lotto…” option. Absolutely awesome and priced to match, Crestron systems allow you to control the source, volume and music tracks using controls in every room in your house. The runner up would be a wireless amplifier system from sonos.com or keep an eye out for PlayFi enabled speakers. We hope this gets you well on your way to immersive, whole house sound. If you ever have any questions, feel free to send an email or dial us up at 888.880.8992 and we’ll be happy to answer your questions on whole house distributed audio or any other audio or video topic. What Is A Crossover? A Beginner’s Guide.